They say cinematic superhero fatigue will soon set it, but honestly we have yet to see real signs of that phenomenon. This year has proven to be the year of the comic book hero, and no film has exemplified that more than Batman V Superman: Dawn of Justice. The film premiered this weekend to packed theaters, and is on track to have an insanely successful run. In fact, during the three days it has been in theaters, Dawn of Justice has racked up quite a few records for itself. According to a new report from Comingsoon.net, the two gods of the DC universe have experienced an equally godlike opening weekend. 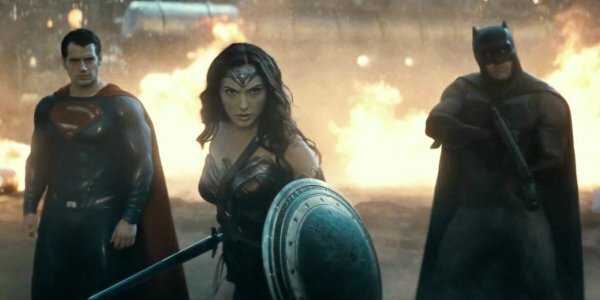 Based off of the reports, it appears that Batman V Superman: Dawn of Justice has opened to $170.1 million in its domestic opening weekend -- the best ever for Warner Bros, and sixth best of all-time. This total also marks a brand new pre-Summer opening weekend record, absolutely destroying The Hunger Games’ previous record by $20 million. The film has also set an Easter weekend record by beating out last year’s record holder, Furious 7. That's alot of records, and we expect more to follow. There’s another record that Batman V Superman: Dawn of Justice has broken that might be the most important of all. In the three days that it has been in theaters and dominated the box office, the film has dethroned 2012’s The Dark Knight Rises in order to become the best opening weekend for any DC comics movie ever. Anyone who had any fears about whether or not the DCEU has a future can now put them to rest. This cinematic universe has proven itself financially viable, now it’s time to look to the future. We will see if Batman V Superman: Dawn of Justice can continue its meteoric rise. The film has met with… Well… Let’s just say the film has premiered to a lackluster critical response. If the negativity aimed towards the film manages to eat into its profits, then next weekend could see a major drop off in Dawn of Justice’s earnings. However, something tells us that, good or bad, people will still want to see this landmark movie. It’s also worth noting that, despite these high numbers and broken records, Batman V Superman hasn’t proven itself to be incredibly profitable yet. The film has earned a bafflingly large sum of money, but it also cost somewhere in the neighborhood of $250 million to make, not including marketing. In terms of proportionality, February’s low-budget Deadpool remains the technically more successful superhero movie. Be sure to stay tuned for more updates regarding the insane financial performance of Batman V Superman: Dawn of Justice. We will bring you and all information related to the historic silver screen event as it becomes available to us. Dawn of Justice is in theaters now; check it out!